The next step is to cutout the raceway, leaving us with the inside piece that we’ll later cover in cloth. This is the most important cut of the project. Make sure you go smooth or steady – our you’ll end up ruining your table. I measured 8 inches inside all the way around. I used my homemade compass to make my arcs, measuring in 8 inches as well from the original arcs hole. First cut out the arcs. I didn’t use one here, but it would be smart to build a jig to make this cut. Careful not to go to fast, your jigsaw blade can get hot and warp, then no matter how strait your marks are, you’ll end up with crooked cuts. Cut out the arcs first, then do the sides. To get started, use a small bit and drill a pilot hole, make sure you stay to the inside (insert side) with the drill. Because the cloth will cover that imperfection, but the raceway will be exposed so you don’t want the pilot hole to show up. 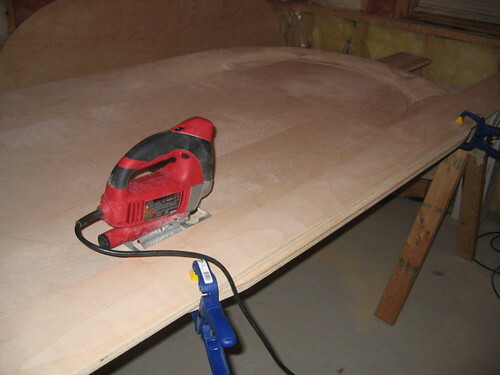 Once the arcs are cut, put a board underneath, so when you cut out the sides, the insert wont fall to the ground. Clamp down your guide, and make sure it’s on the raceway side (smart side), so any mistakes you make will be on the insert, not the raceway. When you think you’ve got enough clamps on, use two more.